The vibrant centre of community activity weaves together nature and the marketplace. Singapore’s famed airport, ranked No 1 in the world, has always been known for its state-of-the-art attractions, rotating selection of works from leading art collections, and stores to get you through any layover. 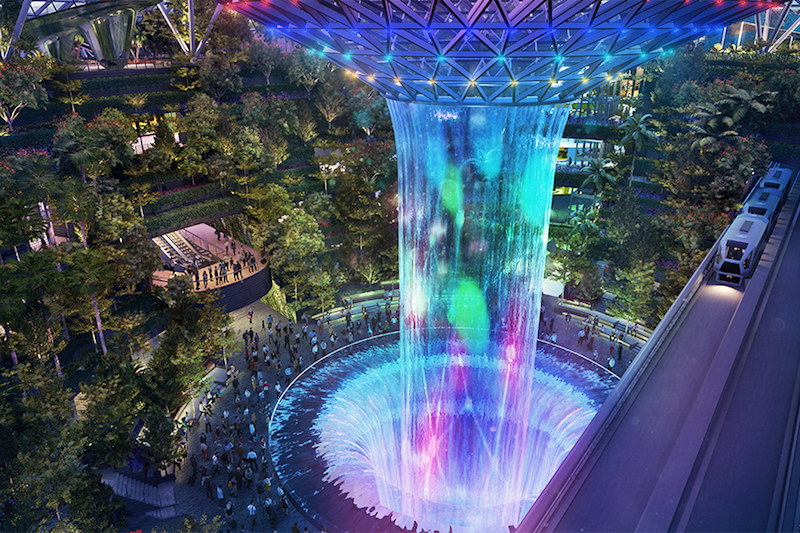 Now, Changi’s latest extension, featuring a lush rainforest, 280 shops and a huge indoor waterfall, is about to tighten its grip on the best airport crown. Jewel Changi Airport is a mixed-use development designed by Safdie Architects, and it’s already welcomed visitors on April 11 for a preview of its wide range of offerings. The multi-floored Jewel, an asymmetrical shaped building between the airport’s existing terminals and the air-traffic control tower, will open officially on April 17. The pièce de résistance of the building is none other than the Forest Valley, anchored by the Rain Vortex waterfall at its heart. Also known as the tallest indoor waterfall in the world, the centrepiece — surrounded by a four-storey garden teeming with thousands of plants and trees —pours from a 40m-high oculus and channels 10,000 gallons of water per minute. Fourteen tree-like columns and a ring beam buttress the domed roof constructed from high-performance glass, allowing streams of light to boost the growth of plants. The top floor, called Canopy Park, features bouncing and walking nets, a sky bridge, two mazes, a giant slide, eight bars and restaurants. American burger chain Shake Shack, Burger & Lobster restaurant, Shaw Theatres and a Pokémon merchandise store are just some of the brands hosted by Changi Airport’s 10-storey retail and lifestyle development. To realise this mega-project, Safdie Architects enlisted global talents in the fields of engineering, landscape architecture, water feature design, interior design and art. The luxuriant landscaped forest is the brainchild of PWP landscape architecture, while WET Design developed a system that integrates sound with 360-degree projections around the vortex to enable nightly light shows upon the waterfall. 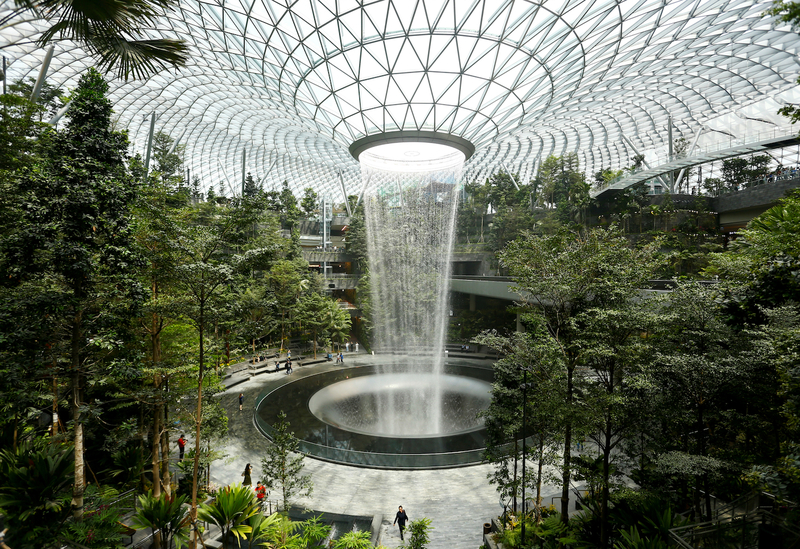 “Jewel weaves together an experience of nature and the marketplace, dramatically asserting the idea of the airport as an uplifting and vibrant urban centre, engaging travellers, visitors and residents, and echoing Singapore’s reputation as ‘the city in the garden’,” says the world-renowned Moshe Safdie. With this new building in place, travellers can expect new check-in counters, a new automated check-in zone and upgrades to the departure and arrival halls. The expansion will increase handling capacity by three million passengers per annum (mppa) to 24 mppa.